Our gentlest handmade soap made from extra-virgin olive oil. 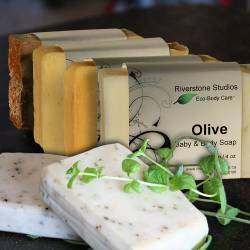 Olive & Comfrey Soap is renowned for its gentle lather and timeless healing qualities of olive oil and comfrey leaf. Great for dry, sensitive or newborn baby's skin. Also effective for skin conditions such as eczema, psoriasis, and cradle cap. This soap started it all! While caring for our infant boys in the bath one evening, Audrey read the ingredients on a bottle of a "no more tears" commercial baby shampoo. Five of the ingredients listed on that bottle was found to be either known or suspected carcinogens. What really made us upset was the words "Our Gentle Ingredients". It may be "no more tears formula", but we suddenly no longer trusted what we read on labels. What started as an evening bubble bath for our two boys in 2008, motivated Audrey to continue her family tradition of making gentle nourishing soaps and body care for our family... and yours.